Dora Shoo started her race walking career in 2013 as a Secondary 1 girl joining the cross-country team in Bendemeer Secondary School. The school was under Coach Fabian William at that time and had achieved consistent podium results at national schools’ level. At that time, Dora had no prior experience of running, “but she had relatively good running mechanics”, according to Coach Fabian. However, Dora was plagued by the biggest problem an athlete can face – she just wasn’t interested in running. Like any typical 13-year-old, she enjoyed spending time with friends at the nearby malls. It didn’t help that her friends were encouraging her to skip trainings, and she obliged; being in the cross-country team had served no purpose for her. After just 1 year in the team, Dora chose the easy option – she opted to quit the team. “I was dejected and dismayed”, said Coach Fabian, but like with all athletes taking the easy path, he sat her down to find out why and to convince her otherwise. At that point, the National Schools’ Track and Field Championships was barely 3 months away. Exploring the options, he pointed out to Dora that she had yet to try other disciplines, to which her response was “I don’t think I can throw the javelin”. “I have no clue till this day as to what made her think I had intentions of developing her into a thrower,” laughed Coach Fabian. “But I said, ‘Dora, since you love walking around the malls so much, let me introduce you to race walking – you don’t have to run, now you just have to walk around the track (shopping not included)’”. The deal was to give race walking a go for 3 months (until National Schools’) and regardless of the outcome, she was free to quit following the competition. That was Dora’s first day as a racewalker. In the following 2 weeks, Dora’s training consisted mainly of walking technique. In race walking, there are 2 main rules to follow – 1. The landing leg must be straight upon contact with the ground; 2. At least one leg must be in contact with the ground at all times. Failure to do so is classified as ‘floating’. Dora adapted easily to race walking, partly due to her body structure as well as her movement mechanics. This greatly helped her preparation because there were only 2 months left; In those 2 months, the only thing there was time for was to work on her walking speed and fitness. On the 12th of April 2014, race walking was making its début in the National Schools’ Track and Field Championships. While it was also Dora’s second time at the championships, this was her first race walking competition – the 1500m Race Walk. Despite just 3 months of training, she managed to keep up to and pressure the leading walker. With a hard fight, Dora crossed the line in second place with a time of 9 minutes and 10 seconds. But in a turn of events, the first girl had faltered and infringed a technical ruling, resulting in a disqualification. In 3 months, Dora was a champion. In 3 months, Dora was a champion. Dora was unprepared for that response, but her decision was already made. He knew it there and then – here was a champion in the making. Dora’s success coincided with Singapore Athletics’ revitalising race walking in Singapore. There was a rise in the number of race walking meets held in Singapore. Naturally, Dora participated in most of them. Her first meet in January 2015 was the 3rd Age Group Race Walk Championships. The meet saw her take the gold in 8:49 mins in the 1600m youth category – a faster time for a longer distance. She built on that with another win at the 41st Singapore Youth and Junior Athletics Championships in March, taking gold in 7:48 mins for the 1500m Race Walk. According to Coach Fabian, this justified the training protocol of overall development used on Dora instead of the typical early specialisation over-mileage model that was used predominantly by others. Dora's training protocol was of overall development instead of the typical early specialisation over-mileage model that was used predominantly by others. One year on from her first win, Dora was back at the National Schools Championships. This time, she wasn’t an underdog, she was coming in as one of the favourites. That year, she was plagued by something else – she had fallen ill a few days prior and had withdrawn from the 1500m run. The teacher-in-charge of Bendemeer’s cross-country team had decided it was best to save her for her pet event, hence the withdrawal. Her illness also masked a crucial point – she was afraid of losing. She knew her running was not as strong as her walking, and thus was very unwilling to take part in the 1500m anyway. Unsurprisingly, Dora was feeling nervous. Her close competitor, Xing Yao, was also gunning for gold. Despite having beaten Xing Yao in all but one race in the lead up to Nationals, her lack of self-confidence showed. On race day, her coaches had a difficult job – getting Dora to calm down. Right from the gun, both she and Xing Yao were playing the waiting game, holding out for the moment to take a lead. But Dora played her strategy to precision. Knowing she had the upper hand in her speed, she managed to hold up the pack and left it to the last 120m to sprint to the win. She took home another gold in 8:05 min – not a personal best, but another well-deserved win. This win qualified her to represent a Singapore Schools’ Selection at the Western Australia Little Athletics (WALA) Track and Field meet. 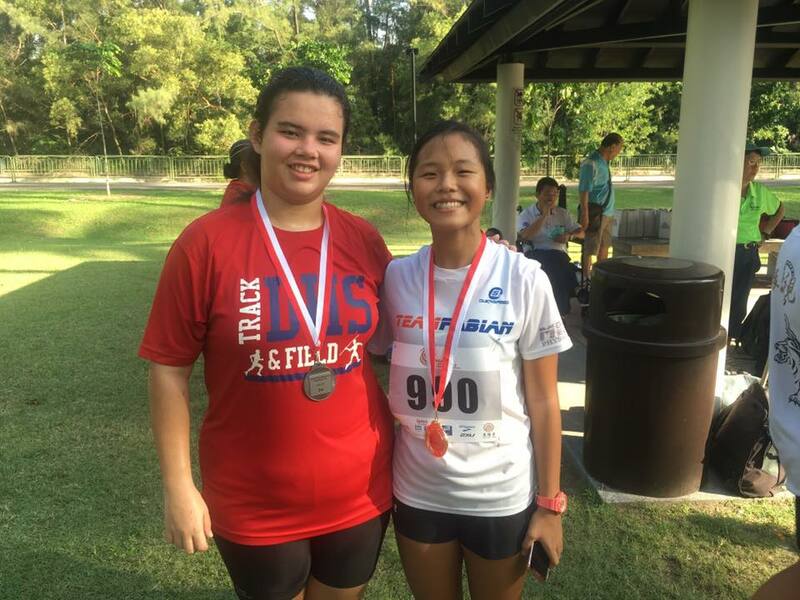 This was her first experience of overseas competition, racing against the best school athletes in the region, and away from home (the meet was held in Kuala Lumpur). Undaunted, she smashed her personal best – this time in 7:25.24 mins – to clinch a bronze medal. It was evident in this meet that the key to Dora’s continuous success was not only the right match of discipline to athlete that triggered all the positives, but also the unwavering support of her family, who made the journey up to KL to lend her their support. Dora in her first regional meet. Dora had the support of her family for the race. The second half of 2015 marked a transitional period in Dora’s athletic career. Succeeding as an athlete had instilled values which were beneficial for her academic life – hard work, concentration, and time management.As a result, Dora was one of the better students in the school. Opportunities began to present themselves to her. She had been selected as captain for her school team for the following year, and also got the chance to meet a State Minister on his visit to the school. At around the same time, Under Armour had started their sponsorship of selected athletes from TeamFabian (a racing club under the umbrella of entities for athlete development run by Coach Fabian and his team); Naturally, Dora was part of the club and caught the eye of Under Armour. After multiple meetings and discussions to understand the needs of the TeamFabian athletes, a deal was struck between them and Under Armour. Dora was the first of the selected athletes to be brought in to collect her gear; Her race in KL was coming up soon and it was a key opportunity for her and Under Armour to showcase themselves. Walking into the Under Armour office, she was greeted by Wilfred, a manager from Under Armour, and 6 pairs of shoes laid on the table in front of her. “Coach, can I take the pink one? I like pink,” Dora asked, wide-eyed. What ensued was a moment of confusion, followed by an explanation. “You don’t have to choose – these are all for you,” clarified Wilfred. There Dora stood, having never been well-off enough to splurge, never been spoiled enough to get whatever she wanted, being given more than she had expected – shoes, training tops, tights, and shorts. Pulling out another box from under the table, he added, “Your coach said you liked pink, so I chose this specially for you – it’s pink-er!” Dora, still in her worn out trainers used for school and training, was being welcomed into the world of being a sponsored athlete. Training in her new Under Armour gear. By this time, Coach Fabian had handed over the coaching duties to another coach in his team. Dora was travelling out of school in order to train with Coach Fabian (who was coaching a different school but at the same times and days as Bendemeer’s training). Back in school, her work load was increasing. While she managed to juggle both keeping her grades up and training, it meant looking for ways to save time such as cutting back on travelling time and sticking to Bendemeer’s training hours. This was further justified by the fact that as team captain, she had to be present during school trainings to fulfil her responsibilities. It didn’t help that any drop in grades was attributed to her extensive training time by her teachers. Her walking performance dipped drastically during this time. The coaches sat down to discuss and narrow down the possible causes for this drop. Eventually, the conclusion was that she had far surpassed the aptitude of her school team. In accommodating training for the whole team, Dora’s needs as an athlete were not met, resulting in the drop in her standard. Due to the school's responsibility for Dora, it was against their policy to let her skip school training sessions to train elsewhere. However, they were willing to look for a solution to help Dora achieve her athletic targets. After multiple discussions, a conclusion was reached. With her parents giving consent, Dora would be allowed continue her training outside of school so that her progress would be better managed. There would also be flexibility in training times implemented to accommodate her academic responsibilities. There was a catch – she had to relinquish her team captaincy due to the lack of face time she would have with her team. Coach Fabian was initially disagreeable with this arrangement, but Dora felt otherwise. There was no time to slow down as the season was still packed with races. Selection trials for the MTR Hong Kong Race Walk were being held, but news of this trial was released very late – less than a week before the trial proper. Up till this point, Dora had never walked more than 4km in training, but the trial was 10km long. In addition, she was ineligible to take part in the actual competition as she was below the age limit. With nothing to lose, both coach and athlete decided to sign up for the trial. She would be walking against seasoned Singaporean race walkers, as well as some of her rivals who were too participating despite their ineligibility. Dora started the trial aggressively, forming the leading pack with Komathi, one of Singapore’s top female race walkers, and Xing Yao, Dora’s closest rival. Eventually, Dora’s inexperience in longer distances showed, and while she managed to stay part of the leading pack, she started to fall behind. Lap by lap, the gap between her and the leader grew to 200m. It was almost as if Dora was resigned to her fate. Dora forming the leading pack. Dora being followed closely by Komathi and Xing Yao. “Five more laps Dora!” Coach Fabian yelled from the sides. To his surprise, Dora sped up like it were the final push. She began to close the gap between her and the leaders. As she came around again, the lap counter read 4 more laps to go. There was a mix of fatigue and confusion in her face. She shrugged to her coach and remarked, “I thought that was the last lap!” Nonetheless, she managed to maintain her surge, catching up with the leaders one by one. By the time she finished her 25 laps, she was in first place, and came in just 20 seconds shy of the 1 hour qualifying mark. The win was a fluke, but it had opened Coach Fabian’s eyes to how much fight she actually had. The next race was the Singapore Athletics Series Walks. It was there that Coach Fabian met Coach Tanaball, a national race walking coach. Dora was well-known in the race walking fraternity by now, and it was no surprise that Coach Tanaball was monitoring her. He offered to help develop the Bendemeer team of walkers with Coach Fabian. While this presented itself as a good opportunity, it didn’t produce the best result. The partnership was struck just as the school holidays came about, which meant many of the school walkers took vacations and were irregular in training. For Dora, the challenge was adapting to a new coach and coaching style. Coach Tanaball employed a different walking style, which included different drills, stretches, and training protocols. Nonetheless, she trusted her coaches and stuck to the training. By the turn of the year, Dora still couldn’t fully adapt to the new pedagogy, and once again she was back directly under Coach Fabian’s tutelage. This time, a new problem had surfaced – Dora had a fat pad impingement in her knee and it was affecting her walking. The athlete in Dora had initially tried to push through the pain during training, but it was evident that she needed treatment. She sought treatment from Movement Mechanics Physiotherapy, who had helped Dora throughout her career. It was a balancing act between seeing the physiotherapists for treatment, and capping Dora’s training to ensure the injury was managed. The after effects of the injury told, as she was still far from her best. Dora only clocked 7:53 mins for her 1500m walk at the penultimate race before the Schools Championships of 2016 despite clinching the gold. It was a trying time balancing her treatment and training to keep her racing condition. But everything seemed to fall into place by the final prep race of the season – the 42nd Singapore Youth and Junior Athletics Championships. Enthusiastically, Dora signed up for not just the race for her division, but the one above her – a 3km walk. The 3km walk was up first, and Dora nonchalantly broke the division record (the record did not stand as she was not eligible for that division). Just 20 minutes later, Dora was up against Xing Yao in her own division. Fear was a thing of the past as a different Dora stepped up to the line. Nothing was going to stop her that day as she broke the National U17 record, clocking 7:23 mins. Finally, it was time for the National Schools Championships. Race walking had definitely gained traction in the 2 years since Dora won her first medal. More participants were joining the event as there were comparatively less competition, but the overall standard was improving. Yet, everyone knew that it was going to be match-up between Dora and Xing Yao. Both girls were placed in different heats, and both breezed through into the finals. Just like the year before, both girls started off conservatively. This tactic didn’t work as well for Dora though, as she found herself boxed in within the first lap. She recovered quickly, side-stepping out of the box and back into the race. The race proceeded as anticipated – Dora and Xing Yao had made their way miles ahead of everyone else. It was their race to lose. They matched each other step for step, until they didn’t. Xing Yao had made the first move – she pulled ahead with 1 lap remaining, but Dora had her on a leash the whole time, never letting the distance grow more than 1 stride long. With half a lap remaining, both girls’ legs were in double time, trying to outpace each other. Then, with just 100 meters to go, Xing Yao pulled ahead again, struggling to keep form as she frantically tried to get into the lead, but Dora had hit her limit. The gap widened, but an official stood up, red card in hand, and flashed it upwards. Dora eased off as she crossed the line. Both girls had pushed each other hard enough that they had faltered in some extent, but finished close enough that the recipient of the disqualification was still ambiguous. What followed was an agonising wait for the results. Coach Fabian was restless, and Dora was emotional. Every technical official who walked out was followed only to be met by groans of the people waiting for the race walk results. Sheet after sheet got sent out, until finally, the ‘B’ Girls’ 1500m Race Walk results were put up. In first place, Dora Shoo. Dora had come full circle, winning her final race in secondary school the way she won her first. The girls gave each other a hard fight to the finish. Dora collecting her gold medal. 1st runner up - Shantel Chua of Bendemeer Secondary, and 2nd runner up - Divya K Rajendran of Guangyang Secondary. Throughout the years, Dora had unwittingly inspired other race walkers in her circle. In 2016, Bendemeer had 2 other race walk medallists at the National Schools Championships in the form of Shantel Chua and ‘Marc’ Chu Meng Hong – Shantel behind Dora and Marc the 1st runner up in the ‘B’ Boys division. The school had other race walkers who were also very successful in the other local meets. Most of them made the switch to race walking after Dora’s initial success. Dora had also started to mentor the juniors in her club, TeamFabian, sharing her experiences and correcting their technique during training. Unsurprisingly, they have started to follow in her footsteps and taking part in the race walking calendar, and even medalling and some meets. It is the hope of her coaches that she will lead the way for a new age of success in race walking for Singapore.